Wooden floors are often difficult to maintain and preserve in their best condition. They easily lose their polish and soon are covered in scratches all over. 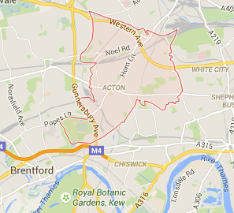 If you feel your floor needs renewing, don’t hesitate to contact our company in W3 Acton. We specialise in floor sanding and will quickly strip your floors of their old coating and transform them so that you won’t be able to recognise them. Our specialists work with the best equipment and machines, they are diligent and detail-oriented – that’s why best results are always at hand. If you want your floors to look as good as new, give us a call right away! Our company in W3 Acton is long established in the floor sanding business and has an immaculate reputation among its numerous customers. We insist on using only the latest sanding equipment to ensure your floors will get that shiny polished look you demand and hope for. Every imperfection from your old boards will be wiped away. Why install a new floor when you can call us and make an appointment right away? 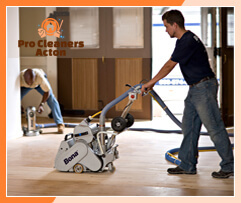 Floor sanding is a demanding process which involves specialised equipment. That’s why high degree of expertise is required. 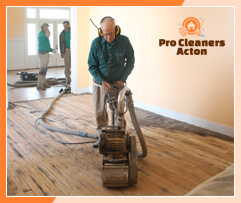 Our experts will first prepare your floors for sanding by removing any protruding nails or boards to avoid accidents. If necessary gaps in the boards are also filled. Once preparation is over, the sanding can begin. Bare in mind our experts use only the most powerful, high-quality belt sanding machines for best results. A professional finishing machine is used to create the final finish on your floor. Then the sanded floor is coated with oils and sealants to block the passage of fluids. As you can see, we truly pay attention to details and know what we’re doing. With us your wooden floors will be in good hands. Our high-quality sanding services will dramatically change the way your floor looks. 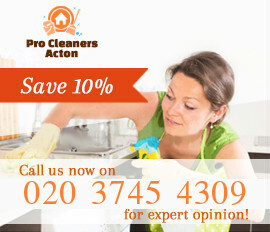 Save money and time – instead of installing a new floor, call our company in Acton W3. You won’t ever regret it!